“Home,” presented by ArtsEmerson at the Paramount Center, runs through Oct. 1. While browsing on Zillow recently, I was a bit jolted to learn that my childhood home had been sold. When my parents initially sold the house two decades ago, I felt a twinge of sadness, a burst of completely irrational resentment toward the first buyers, and a vague but nagging sense of loss. Now, to my surprise, the resale brought back those same sensations, all this time later. Perhaps what bugged me was the fresh confirmation that the place that seemed so special to me was, in the end, just another transactional piece of property, a thing of wood and brick destined to be inhabited by successive waves of other people as time marches on. Well, duh, right? But there’s nothing rational about our connections to the place we call home. Geoff Sobelle clearly understands that. 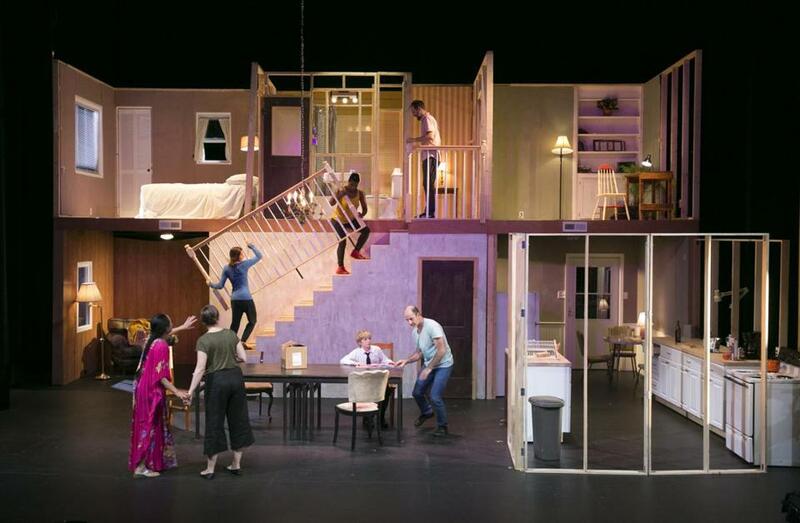 Sobelle crafted the ingenious, surprisingly entertaining “Home,’’ a nearly wordless theater piece that speaks volumes about the conflicting emotions that surround those places where the stories of our lives take shape. A production by the New York-based Beth Morrison Projects presented by ArtsEmerson, it’s at the Paramount Center only through this Sunday, which is not nearly long enough for a show this unique. Under the dynamic direction of Lee Sunday Evans, with scenic design by Steven Dufala, “Home’’ adds up to a wholly unique blend of concept, stagecraft, movement, music, and visual storytelling that gives fast-moving form to the ways, large and small, in which a house becomes a home. In the process, “Home’’ captures the drama of everyday life — which, of course, seldom feels all that dramatic to us as we live it. Like A.R. Gurney’s “The Dining Room’’ and Dan LeFranc’s “The Big Meal’’ — and, for that matter, Thornton Wilder’s “The Skin of Our Teeth’’ — Sobelle’s “Home’’ is a meditation on the relentless passage of time. A key difference is that the titular structure in “Home’’ is assembled (and later partly disassembled) right before our eyes on the Robert J. Orchard Stage. DIY theater meets physical theater, a kinetic adventure in build-your-own-set and build-your-own-metaphor. The construction of the two-story structure is akin to a precise, high-speed ballet, if dancers wore yellow hard hats and carried staple guns. Once the wooden frames have been assembled (the front is left open) and the furnishings and appliances have been installed, what unfolds is a series of humdrum rituals and momentous events. They are enacted by a highly skilled cast of performers who include Sobelle, Sophie Bortolussi, Josh Crouch, Ching Valdes-Aran, Jennifer Kidwell, Justin Rose, and Elvis Perkins. A woman makes tea in the early morning, settling into the rhythms of the day. A sunglasses-wearing man, toting a surfboard, heads out the door, presumably for the beach. Another man enters the house carrying a bicycle, evidently just back from a ride. A concerned-looking woman holds X-rays up to the light. Multiple performers take part in a marvelous quick-change scene in a shower stall, each of them materializing from behind the curtain, one after another. Births, graduations, marriages, deaths: The entire human adventure plays out onstage. Perkins composed the music, and he strolls about the stage, singing, while playing an autoharp, a guitar, and a ukulele. A contribution to the overall atmosphere at first, his performance eventually becomes a distraction. It’s about the only misstep in “Home’’ as pantomimed scenes flash by in the house’s kitchen, dining room, bedroom, and bathroom. Encompassing multiple generations, what emerges is a portrait of the home — any home — as both locus and launchpad. Despite its somber and poignant interludes, the overall vibe throughout “Home’’ is communal and largely cheerful. Indeed, the show turns into an all-out party at the end, complete with an exuberant conga line, to which the audience is invited. An invitation to this “Home’’ is very much worth saying yes to.